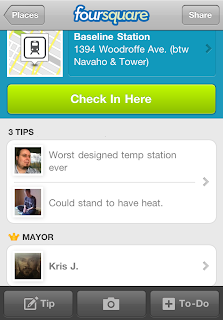 One of the first applications I downloaded when I got an iPhone last fall was Foursquare. I knew that it, along with geocaching, were two must have with the newly-acquired smartphone GPS abilities. Foursquare, for the uninitiated, is a location-based game where you can check into the venues around town that you visit. If you check in more than anyone else, you become mayor of that location. Being mayor does have its perks — mostly in the form of special discounts and privileges at certain locations. Unfortunately, there isn't any fare discounts for mayors - yet. Throughout the day, you are able to use Foursquare to check into bus stops, bus stations, Park & Rides, and bus routes along your commute. While not every stop or route is on there (anyone could create the ones that are missing, though), OC Transpo is well represented throughout Ottawa. One of the little joys of my daily commutes is checking into the stations I use and seeing how much closer I am to becoming it's mayor - or seeing that I am still mayor of said station. It's real motivation trying to win back the mayorships from which you've been ousted. Foursquare is a true location-based game that really does add to the OC Transpo experience, so jump in if you haven't already! Campus: Wasif A. / Dustin G.
Jeanne d'Arc: Steve D. / Tomas / Lindsay M.
While the following stops are on the Transitway map, they are either tough to find on Foursquare (I didn't try too hard) or not actual stations along the Transitway: Kanata North, Stittsville, Barrhaven Centre, Woodroffe, Moodie, Riverside, Montréal, Blackburn Hamlet, Riverview, Leitrim, Airport, and Hawthorne. It would take far too long to rustle a list of route and bus stop mayors. I did notice there aren't very many multi-station mayors - most mayors are only mayor of one station. With so many regular users checking in daily, it may seem hard to earn (steal?) a mayorship, but it isn't impossible if you are diligent, and carry a bus pass. After all, it is hard for mayors to maintain their mayorships, especially as the prevalence of smartphones and number of Foursquare users continues to increase. Give it a try!